This season’s Steamboat’s Rock The Boat Free Concert Series is underway with The Main Squeeze set to play this Saturday. All concerts are free to the public and take place on the Steamboat Stage in Gondola Square beginning around 3:30pm (with some exceptions). “This year’s lineup provides a little of something for everyone, with a wide span of musical options,” said Katie Brown, vice president of sales and marketing for Steamboat Ski & Resort Corp. “To be able to bring together our guests and staff in the base area with a musical celebration each weekend is one of the highlights of a visit to Steamboat.” We have some old favorites returning and fresh new additions to keep everyone on their feet dancing. A powerful combination of hip-hop, funk, and rock, the Main Squeeze has vastly evolved from their humble beginning as a party band at Indiana University. 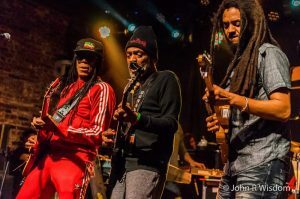 Their unique sound and soulful energy have propelled them to the stage at Red Rocks as well as performances alongside The Roots and Aloe Blacc. The soulful sound of front man Corey Frye’s vocals mixed with creative instrumentals bring an emotional and funky stage presence that invites the audience to experience and enjoy life. The Main Squeeze debuts their new album, “Without a Sound”, this April which continues to build on their classic yet innovative music with the goal of appealing to the senses of their listeners. Building on their previous roots-rock hits, Freddy Jones Band most recently released “Never Change”, an album described as “euphoric” by the band’s lead singer/songwriter Marty Lloyd. Lloyd is a founding member of the band that was formed in the early ‘90s and is accompanied by Rich Ross on bass, Stu Miller on guitar, and drummer Goose LaPoint. This long-running act brings a mix of Southern rock and blues producing number-one singles such as “In a Daydream”, “Take the Time”, and “Those Diamonds” from their newly debuted album. Throughout the ‘70s, Bob Marley & The Wailers helped bring the genre of reggae music to the world. Today they continue this quest in memory of their original front man after his untimely passing in 1981. Several original members, including Aston ‘Familyman’ Barrett on bass guitar and lead guitarist Donald Kinsey are among the eight-piece band delivering a bright and innovative sound. The group continues its mission of sharing Bob Marley’s message of unity and the spirit of their leader alive through music. Miles of snow-covered terrain waits to be explored in and around the Yampa Valley. At Condos in Steamboat, we often get asked for tips on cross-country skiing, so we decided to call in a local expert. Steamboat Springs native, teacher Jess Aldighieri, was raised on skis. 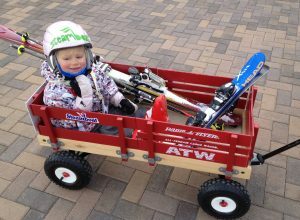 She lives with her husband, Bobby, a former Olympian and freestyle program director for Steamboat Springs Winter Sports Club and their toddler son. Skate or classic, what should someone who has never tried any kind of Nordic skiing consider? JA: Depends on interest and physical ability. 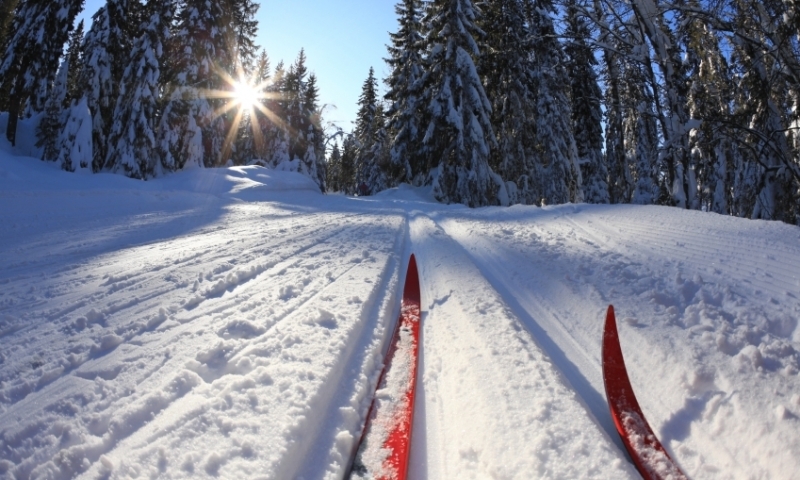 Classic skiing is a good foundation for Nordic skiing and will help your skate skiing. Classic skiing is easier to learn, but difficult to become more efficient. Skate skiing is the opposite. What should you wear Nordic skiing? JA: A lightweight long sleeve Smartwool top, tights or light long underwear bottoms, covered by lightweight Nordic ski pants and jacket. Well fitting gloves and boots will make the learning experience more enjoyable. A lightweight hat or neck buff will help trap body heat. Any tips to improve performance and speed for skate skiing? JA: Skiing in general is about balance, position and timing. If you can improve these basic skills, your efficiency will increase. As a result, you will gain ground on your performance and speed. Skate skiing is all about the application of power to the snow. Strengthening your technical ability will help accelerate your ability to apply power. Best techniques to keep you upright on a downhill turn? JA: Keep your feet underneath your hips and constantly move your feet. The old classic – bend your knees! If you want to try Nordic skiing as a family for a day what do you advise? JA: Make an adventure out of it and carry a picnic or small snack in a backpack, because it’s quite physically demanding and you’ll need to refuel when you’re out there. A day of classic skiing can be great fun for everyone in the family. Most memorable day you’ve ever had Nordic skiing in Steamboat? JA: Wow, there have been so many, but skate skiing the Hogan Park trail on spring crust after Mount Werner was closed. The snow was fast and the sunrise was beautiful. After an adventurous decent on our skinny skis, we finished with a run in the mud on B.C. Ski Way with our backpacks and skate gear. You’ve had an epic day on the mountain but your body is aching and you are balancing not only your own skis on your shoulder, but your worn out kids stuff too and you are corralling everyone to catch the bus in ski boots. Sound familiar? If you are not renting slope side, then we have a few solutions to ease the pain. Rent from Christy Sports and you can store your gear at their mountain location and rent a daily locker for anything you don’t want to carry around. Fleischer Sport by the base of One Steamboat Place will store your skis and boots for free every night. It might be pricier than some of the other on-mountain ski hire, but those heated boot dryers will make you happy you paid more. Beneath the newly remodeled Timber and Torch is the Ski Corral, which offers overnight storage for $12 a-day and weekly ski storage for $60. Lockers are available in the gondola building for daily use from $7 per day. If you are happy to keep your skis, boards and boots but need a spot to leave your lunch or smaller items, the basket check or unlimited bins in the Thunderhead Lodge are great options, from $2 per day. Ski and Sport have baskets from $3 per day and overnight storage for $5 per day or $28 for 7-days. The Sheraton Ski and Sport offers a small bin for $6 and a large bin for $10 per day. If you’d rather save the money and need a helping hand schlepping gear, look out for the little red wagons that make the walk between the bus pick up and gondola building less strenuous. 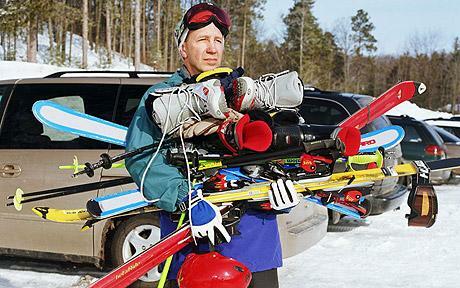 The novelty factor might even turn your weary skier into a pack mule for the short journey. 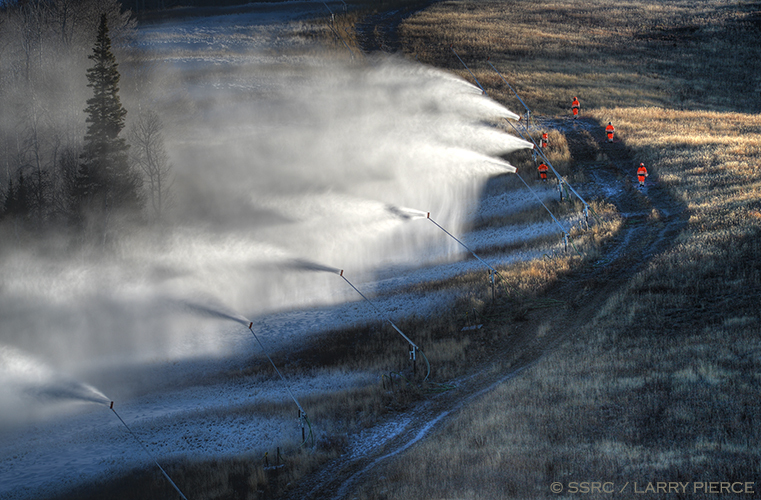 Snow making at Steamboat Ski Area. Photo: Larry Pierce. As darkness lifted in the early hours this morning, little plumes of moisture could be seen clouding in clusters over the Steamboat Ski Area. The snow guns were out and Mount Werner was getting primed for her winter coat. On November 21, Alterra Mountain Company will pop the cork on bottles of Korbel and open their gondola doors for the first riders and boarders of the 2018/ 19 season. New resort owners Alterra, have already started to make a mark on their master development plan for the ski area. The Bear River Bar and Grill at the base of the mountain underwent a mammoth transformation this summer and will reopen as the Timber and Torch. Expanded indoor seating, an oversized deck with outdoor fireplace and barbecue grill area are just some of the changes guests will be able to enjoy. On the snow, diners can look out for the Taco Beast, a snowcat-come-food truck for some Mexican themed fast food and new signage marking trails and lifts. Although the resort’s 2,965 acres remains untouched, plans are afoot for future developments. As the new season starts, one thing is certain, the annual line up of winter festivities stays unchanged. The Yampa Valley’s long list of winter traditions will be celebrated on and off the mountain, in true Steamboat style. Cheers to the next winter season. Routt County’s scenery explodes into a backdrop of spectacular reds and golds during fall. Take to the roads and leave plenty time to pull over and take photos. Favorite drives include: The Flat Tops Wilderness Area Scenic Byway from Yampa over Dunkley Pass and Ripple Creek Pass; Elk River Road to Hahns Peak and Steamboat Lake; or Rabbit Ears Pass to Muddy Pass. Spot an array of wildlife on the hillsides or roaming in the valley floor. It’s a busy time for our resident moose, elk, deer and bears. Keep a safe distance and use binoculars or telephoto lenses to watch them. Never approach a wild animal and make sure dogs remain on a leash. Plan for cooler air temps in the mornings and evenings. Dress like a local and opt for layers. Several of the nations biggest players in outdoor recreation clothing and gear started out right here in Steamboat. Check out sidewalk sales throughout fall where last season’s gear can be a steal. You’ll have to race to the rack to grab anything from Smartwool or Big Agnes. It’s not just beer and brats on the menu this season, although you can find both in abundance at Steamboat’s OktoberWest festival on September 14 and 15. Sip local brews and pedal from pub to pub, while raising money for a great cause in the annual Mustache Ride on October 6. Dine for less during ‘mud season’ when some of the town’s best eateries will be offering specials. Hunting season brings elk to the table in tasty stews and steaks. Homegrown apples, plums and the last harvest of peaches bubble inside cobblers and pies. Get a taste of local flavors at the first ever Yampavore dinner on October 11 at Harwigs Restaurant. All proceeds from ticket sales will go to support the Community Agriculture Alliance. We’re serious here – if you come on Halloween, you will need one. The downtown stroll is one of the community’s most cherished events. For two hours, Lincoln Avenue is closed to traffic and open to ghosts, ghouls and goblins. Join the throng of locals wandering from store to store on a trick or treat quest. Dress up and take part, or kick back with a cocktail and watch from the sidelines. October 31, 5-7 p.m.
Photo by Steamboat Ski Resort. 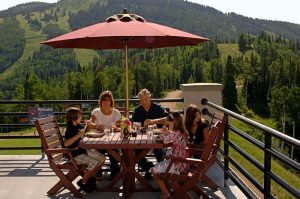 Warm summer nights and eye-popping sunsets make the perfect pairing for outdoor dining in Steamboat Springs. An extensive range of restaurants mean there is always something on the menu for everyone. If views are the order of the day, there is plenty to satisfy the eyes, and we’ve handpicked our favorites. Located a couple miles on the outskirts of town, the family-friendly grill offers wrap around views of the rolling south valley. Eagles and herons frequently soar the skies above the 18-hole links-style course, adding to the ambience of this golf lovers’ paradise. Patio games occupy younger diners while grown ups can sip cocktails and feast on local fare. The restaurant is open all day and welcomes visitors, whether they come for the golf, or not. 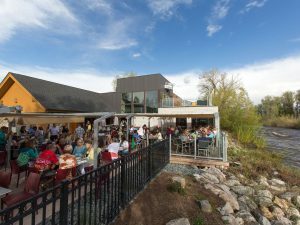 Set on the banks of the Yampa River in the heart of downtown Steamboat, the garden setting at E3 Chophouse is a magnate for outdoor diners. Although one of the pricier options around, their Happy Hour offers tremendous value for money. As the name suggests, steak weighs heavily on the menu, along with rich sides and a lobster mac n’ cheese that keeps locals coming back for more. Further downstream on Yampa Street is Aurum, a laid back bar and eatery with uninterrupted views of the iconic Howelsen Hill. A massive deck with a fire pit keeps folks enjoying the outdoors, even after the sun goes down. Families love the adjacent grassy space, which offers an enclosed space to run around and dance in, when a live band plays. An additional second level deck is popular with groups and gives diners a birds’ eye view of all the action on the river. Bike, hike or stroll by the locals’ favorite hang out spot at the base of the Steamboat Ski Area. Kick back by Burgess Creek and let the kids run free while you sip locally brewed suds and feast on traditional American fare. Slopeside is an ideal spot to refuel during a day spent exploring Mount Werner, or grab a bite, before one of the free Movie on Mountain shows. Nothing beats the backdrop. Your chariot awaits, to take you to brunch, literally – in the form of a gondola. Every Sunday until September 2, diners can ride in style to the top of Mount Werner for the ultimate room with a view. Brunch is served from 10 a.m. until 1p.m. at Hazie’s Restaurant, which offers guests the option of inside dining behind panoramic windows, or on the outside deck. Diners over 21 years are served Mimosas or Bloody Marys, and everyone can feast on a smorgasbord of delectable offerings. Reservations are recommended. Have you ever sat in the gondola and looked out the window to see someone ascending Mount Werner on skis and wondered ‘what is that person doing – why hike when you can ride?’ Either they want to earn their turns and get heck of a work out, or they don’t want to pay a full price lift ticket. 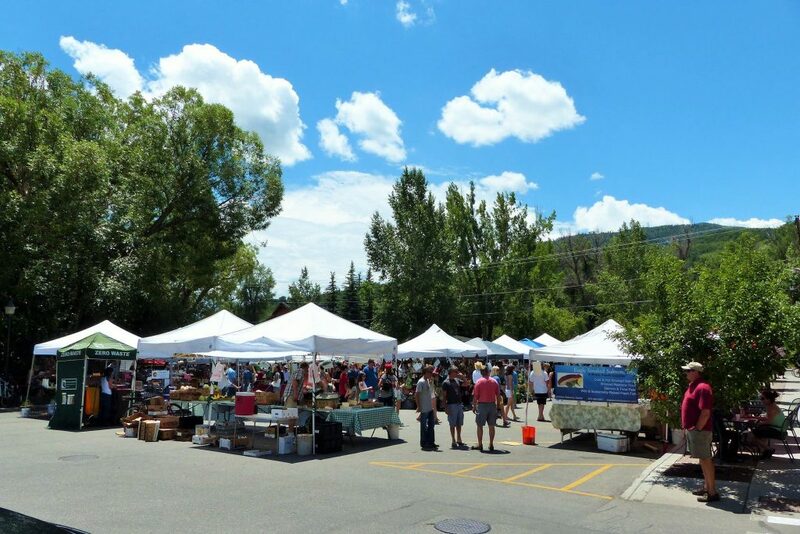 Whatever the motivation ‘skinning’ is on the rise and Condos in Steamboat decided delve into the details of this growing pastime. We sat down with Kent Vertrees, the self-proclaimed master of chaos for Steamboat Powdercats, a local operation that added guided backcountry skinning trips to their repertoire this season. Condos in Steamboat: What is skinning? 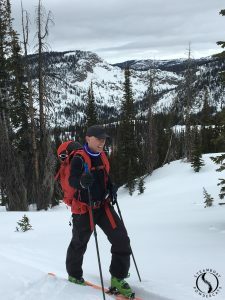 Kent Vertrees: It is hiking uphill wearing all terrain gear with skins attached to the base of the ski which enables it to grip the snow. At the top, peel off the skins and ski (or board) back down. CIS: Why is it becoming so popular? KV: It’s a natural progression as a skier or snowboarder to move out of bounds and try new things. Skinning in the backcountry gives expert skiers a challenge. Plus advances in technology are making it easier; lighter skis, better skins, more accessibility, avalanche beacons and general safety information. CIS: What equipment do you need? KV: Basically you need to dress for hiking in the backcountry, which means layers, (Gortex is great to keep moisture out), hat, and sunglasses; a backpack with safety equipment such as a beacon, avalanche probe and shovel; a water bladder to keep hydrated. Extra clothing is good so you can change when you get sweaty. You’ll need skis, skins and poles, or a split board. All terrain gear includes a specific all terrain boot and skis that enable the walk mode. CIS: Any tips on technique? KV: Keep your head up – don’t look down at the skis. Poles out front, and glide skis don’t lift the whole ski. Maximize energy and minimize your effort, one step at a time. Look for the lowest pitch aspect. You don’t want to crisscross the snow where you plan to ski down. CIS: Can anyone do it? KV: You have to be a good level of fitness. If you want to try it in the backcountry then you should go with a guide who can teach you how to put skins on, work the bindings and how to do kick turns. Guides are also familiar with the terrain and know where it is safe to go and where it isn’t. CIS: What do you do once you get to the top? KV: Catch your breath, take off skis, lock bindings down, change clothes, hydrate, eat and descend. CIS: How do snow conditions affect technique and overall experience? KV: On a sunny warm spring day skis and skins can get clumped up with snow. In deeper conditions it is more difficult to set the track, which is another benefit of having a guide. On days when it’s stormy, consider your gear as you can get really wet and thermal regulation is key. On deeper and lighter days, the smiles get bigger. 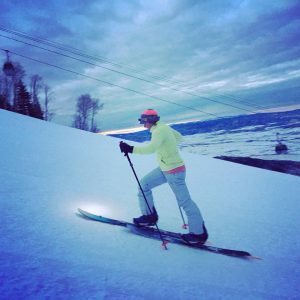 Hang out with an Olympian in Steamboat Springs. 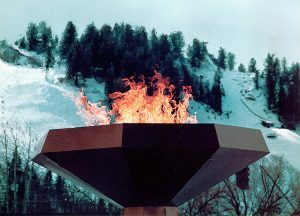 The Olympic flame flies at Howelsen Hill. Did you know Steamboat Springs has produced more Olympians than any other town in America? Luckily for us all, many of them continue to call Steamboat home and are often on hand to share a tip or two on the slopes. Next time you are in the ‘Boat seek them out – here’s where to find them. Howelsen Hill – home of the Steamboat Springs Winter Sports Club and ongoing training ground for current and future Olympians. On most Sundays expect to find head Nordic coach, Todd Wilson at the base of the jump hill tempting you give ski jumping a try. It’s not as daunting as it sounds – everyone starts on the bump jump. It’s fun, free and strangely addictive. Steamboat Ski Area – ski down Heavenly Daze with Billy Kidd on any given day. Look for the notice at top of the gondola to see if he is skiing that day and meet him at 1 p.m. by the start of Why Not. On Sundays at 1 p.m. improve your mogul skiing on Nelson’s Run with expert tips from Nelson Carmichael. Both activities as free to lift ticket holders. Ladies can sign up for the three-day women’s clinic, which has been offered at Steamboat for 25 years. Ann Battelle and Deb Armstrong lead the line up of instructors. Spaces are still available for March 6-8. Tread of Pioneers Museum – check out the ongoing Ski Town USA exhibit at the museum on the corner of 8th and Oak Streets. Find out how skiing and boarding has evolved over the last century and check out Olympic memorabilia. Booking a ski trip means two things: great adventure with a great big price tag, right? Not necessarily. Book early or get clever and consider other ways to save money. Rent a property and split the cost with family and friends. Condos in Steamboat have a wide range of accommodations to suit a range of group sizes and budgets. Save money on food and pack a lunch. Dining on the mountain is very expensive and if you are not staying in a ski in/ ski out location it can get pretty pricey eating on the hill every day. Buy multi-day lift tickets in advance. Daily lift prices are reduced the more you buy. Plus, did you know that kids under 12 years old ski free at Steamboat with a paying adult? Don’t rent a car and use resort shuttles. The City of Steamboat operates a free bus service between town and the mountain so you don’t need a car. It makes eating out taste all the more sweeter when no one has to drive home. Look for happy hour specials on drinks and food. Eat out at lunch-time and cook at the condo for dinner. 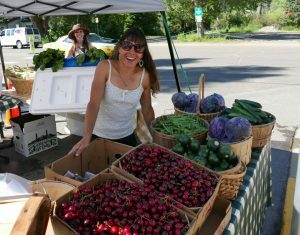 Check out the free local newspaper Steamboat Today for daily specials and events. Don’t buy ski or snowboard equipment, which just keeps getting better every year. Rent gear once you arrive in town or pre-order and have it delivered. Spend a day in downtown Steamboat on Howelsen Hill, the oldest continuously running ski area west of the Mississippi, where you can Alpine ski, snowboard, cross country ski and fat bike. It’s compact which makes it perfect for family and groups of mixed ability to stay together. It’s inexpensive and on Wednesday nights you can try ski jumping. Pick up tips for free every day on the mountain and ski with a Steamboat Ambassador. Tours for intermediate and above level skiers leave from the top of the gondola at 10.30 a.m., just look for them in their yellow jackets. Travel at off peak times, which means avoiding school vacations and some weekends. Like us on Facebook and keep an eye out for last minute deals through the season.